I don't think I've ever been so busy in my life, but at the same time so... idle. It's a strange combo to have, but life is so much different back at home and away from the dorm rooms, the class lectures, and friends. I'm working 40 hours a week, 8 hour days which seem to take up pretty much my entire day since I'm normally scheduled around noon. Although I love being able to work and save up for the next few years, I know I had a lot more free time while I was in college, even while working part time. But today is my day off, part of my weekend, and this is where the feeling of idleness comes into play. At school, I'd normally be doing something on my weekends, whether that be working on some paper I procrastinated on during the week, or spending time hanging out (or going out) with friends. There was always something I could be doing. At home, this isn't quite the case. When I'm not working, I'm usually just at home not doing anything. As much as I appreciate the occasional breather where I can just relax and not have to worry about anything, it can become rather redundant after awhile. I need to accomplish something, or at least find some excuse to get out of the house. It would be much easier if I didn't live in a small town 30 minutes away from pretty much everything. I know I'll figure out something... eventually. Since I generally try to keep my posts with money-saving tips and other freebies/ ways to earn cash, here's what I have to say about summer vacation: No tuition payments or room and board! How's that for some extra cash in the pocket ;) (assuming you're not taking any summer courses and your parents are as awesome as mine and let you move right back home). Oh, and if you can get a job over the summer, even better! I'm excited to say that I just got hired yesterday to work at Costless food company. Most likely I'll start off as a bagger, but with over a year of cashiering experience at Kmart, hopefully I'll soon be able to advance to a cashier there too. The New Glade Expressions and BzzAgent! One of these projects happens to be BzzAgent, an awesome site that lets anyone (not just college students) join to test out free products in exchange for their valuable feedback. Because of BzzAgent, I had the opportunity to try out two different products from Glade's new Expressions Collection. I'm so glad I was able to try these, because I probably wouldn't have even given these a second look. The Pineapple and Mangosteen oil diffuser (although not my first choice of scent), was actually a lot better than I had expected it to be. It was a bit strong for the first few days, but after that it was just enough to permeate the room and leave it with a nice, refreshing, tropical scent. And I loved the design of it, it fit it very well with the table in our dorm living room. Here's a picture of it in the dorm! My favorite product of the two that I tried out was the Lavender and Juniper Berry fragrance mist. The smell of it was just plain AMAZING, and it actually reminded me of those gummy berry snacks that I used to love in elementary school. 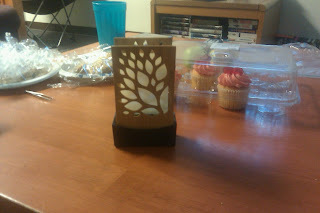 It gave my dorm room a very lovely, inviting smell that I enjoy having after a long day of classes. And the design of the bottle (with a removable label) is very unique and modern to look more like a decorative object than like a plain, regular bottle of fragrance mist. I think we all understand how easy it is to begin something, continue to work on it for awhile, and then eventually forget about it and leave it as a never-to-be-completed work in progress. I couldn't even tell you how many times I've done this. Books, drawings, projects: all worked on to an extent, only to be scattered forever amongst all of the other unaccomplished ideas. I had a feeling this is where my blog was going for a little while. But this is where a little bit of Self-Motivation and extra effort come into play! Now I won't deny that I've been a little bit distracted with all of this getting-ready-for-college stuff, and it might still have an impact on my ability to write future posts. But I will definitely be sure to put aside a little extra time to keep everything updated. $10 Worth of Free Items PLUS Free Shipping! Here's an offer that's impossible to pass up. When you sign up for Vitacost, you get $10 to spend on their website!! And now through April 12, you get free shipping on your entire purchase as long as you add their Vitamin D3 Capsules ($4.99) to your shopping cart, leaving you with just over $5 to spend on whatever you want with NO shipping costs! They have a lot of awesome products to choose from: shampoo, conditioner, vitamins, food, baby products, soap. Too much for me to list here! I decided to use the remaining $5 I had on an 18 oz Nature's Gate Pomegranate and Sunflower Shampoo and Superior Bee Flower Rose Soap! And also be sure to add two free samples to your cart. Remember this promotion ends on April 12! But even if you do miss the deadline, you can still sign up to get the $10 code. Vitacost is constantly having free shipping promotions like this, so even if you miss this great deal, save the email you received with the $10 code and keep your eyes peeled for their next free shipping promo! I know that guys are usually the ones known for playing video games, but I do play my fair share of video games too. Gog.com is offering a free PC download of Fallout today and tomorrow only!! This game has 5 star ratings btw! Add the game to your account here. If you don't have an account, registration is free and easy and they give you 6 additional games just for signing up! Their site also has a great selection of games at reasonable prices, generally $10 and under. How is everyone doing with their savings so far? Some of you may know that I said I was going to be compiling a list of companies that you can email to get even more savings, so here is the beginning of what will hopefully be a very long and useful list of companies that will send you coupons if you ask them nicely. In case you're wondering what to include in your emails to these companies or any others you contact, here's a sample email that I sent to Azteca Foods (of course I never got a response from them, but this is generally how I structure my emails). Good luck with your emails! I'll be sure to update the list of companies as I get more coupons in the mail! I'm a college student who graduated in 2011. Since I graduated ahead of schedule, I decided to take a gap year and have just now completed my freshman year at Fresno Pacific University!